Relatives of the victims of the 1995 Srebrenica massacre have filed a case against the Dutch state and the UN, saying they allowed it to happen. The Bosnian town of Srebrenica was a UN safe haven under the protection of Dutch peacekeepers at the time. About 8,000 Muslims were killed after Bosnian-Serb forces overran the town. The case was filed before The Hague district court. 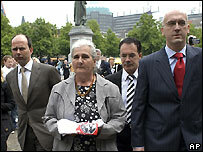 Dutch officials say compensation claims should be directed at the perpetrators of the massacre. Two-hundred women from the group known as the Mothers of Srebrenica carried banners in a silent march outside the Dutch parliament. Their lawyers said the Dutch were to blame for refusing to give air support to their own troops defending Srebrenica, claiming that would have prevented Bosnian-Serb forces from advancing. The Dutch cabinet resigned in 2002 after a report blamed politicians for sending the Dutch UN troops on an impossible mission. The Bosnian-Serb troops were under the command of General Ratko Mladic and the former leader Radovan Karadzic, the war crimes tribunal's most wanted fugitives.